Woodbridge, VA-With just seven hits combined over both games of Tuesday night's doubleheader, the Potomac Nationals (3-3) were swept by the Carolina Mudcats (4-2). The visitors took game one 7-2 behind a five-run third inning, and game two on the backs of a leadoff home run from CF Joantgel Segovia. Tuesday's opener was scoreless through the first two innings, as RHP Malvin Pena (L, 0-1) retired the first six batters that he faced. The debuting right-handed starter's night fell apart after that, as the first three batters of the inning reached base safely and eventually scored. LF Zach Clark's two-run double put Carolina on top 2-0, while C Payton Henry notched his own two-run double. DH Mario Feliciano ended Pena's night with an RBI double, as Carolina led 5-0 after 2.5 innings. The Mudcats tagged Pena for five runs on four hits over just 2.2 innings. Potomac got a run back in the third inning against RHP Christian Taugner (W, 1-0), as DH Cole Freeman got hit by a pitch and scored on an RBI double from LF Telmito Agustin . After 1B Aldrem Corredor drew a walk, CF Nick Banks lined into an inning-ending double play. Taugner allowed just one run on three hits over six innings in the victory. The Mudcats added a run in the fourth inning on a home run from RF Rob Henry off of RHP Carlos Acevedo and another on a sacrifice fly from 3B Dallas Carroll an inning later. Potomac put the final run of the game on the board, as RF Jack Sundberg plated C Jakson Reetz with a groundout. Sundberg's RBI brought Potomac within five at 7-2, but that was as close as Potomac came in the loss. Things got off to a rough start for Potomac in game two, as Segovia homered off of RHP Luis Reyes (L, 0-1) on the second pitch of the game. 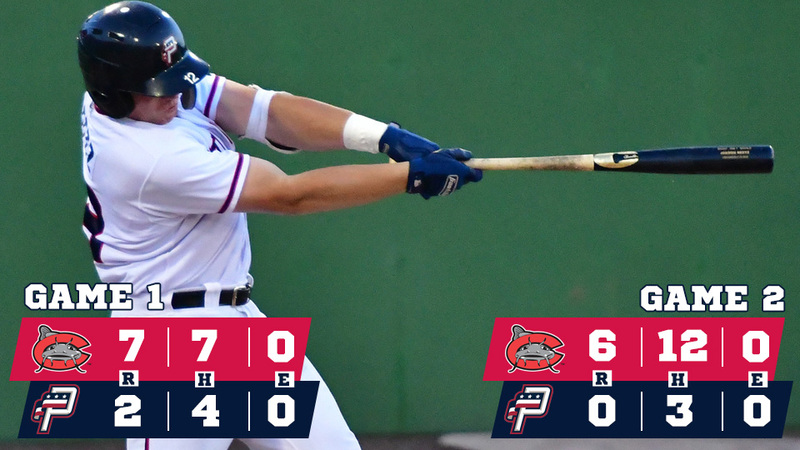 The leadoff home run put Carolina ahead for good, as Potomac managed just three hits in the 6-0 shutout loss. Carolina led 2-0 before Potomac stepped to the plate for the first time. The P-Nats had an opportunity to get on the board in the opening inning against RHP Matt Smith (ND), as Corredor doubled and DH Anderson Franco walked with two outs, but Sundberg took a called third strike, which ended the inning. Potomac had just two more baserunners the rest of the game, as the Mudcats pitching staff faced just one over the minimum over the final six innings. Already ahead 2-0, Carolina added a run in the third inning on an RBI single from Feliciano, and three more, all charged to Reyes, in the fifth. Reyes departed for RHP A.J. Bogucki with the bases loaded and one out in the frame, while all three inherited runners scored. In the loss, Reyes allowed six runs on nine hits in 4.1 innings. Potomac went in order against RHP Matt Hardy (W, 1-0) in the fifth inning, sent the minimum to the plate against RHP Cody Beckman in the sixth inning, and went in order against RHP Rodrigo Benoit in the final frame. Off of the doubleheader sweep, Potomac will need a win on Wednesday in order to avoid a series sweep. RHP Kyle Johnston (0-1, 15.43) is set to start for Potomac. The right-handed starter retired the first seven batters that he faced on Opening Night but failed to make it through three innings. For the Mudcats, RHP Bowden Francis (0-0, 4.50) will aim to tally the sweep. Francis struck out eight and walked just one in his 2019 debut. First pitch at Northwest Federal Field on Wednesday night is set for 7:05pm. The Potomac broadcast will get underway at 6:50pm with the P-Nats Leadoff Show. You can listen to the Potomac broadcast at potomacnationals.com, at http://bit.ly/P-NatsBroadcast, or on the TuneIn Radio App. The Potomac Nationals of the Carolina League play at Northwest Federal Field at Pfitzner Stadium in Woodbridge, Virginia, and are the Carolina League affiliate of the Washington Nationals. The Potomac Nationals have claimed five Carolina League Championship titles (1982, 1989, 2008, 2010, and 2014) and ten CL Northern Division Championships. Sponsorship opportunities for the P-Nats' 2019 season and beyond are available, as well as all-inclusive corporate picnic outings to watch the future stars of the Washington Nationals at The Pfitz. 2019 Potomac Nationals season tickets and mini plans are now on sale. For more information on Potomac Nationals 2019 season tickets, mini plans, group outings, picnic packages, fundraisers, and all things Red, White, and Blue, visit the P-Nats online at www.potomacnationals.com, follow the P-Nats on Facebook (@PotomacNationals), Twitter (@PNats42), and Instagram (@pnats42), or call the Potomac Nationals' Extreme Custom Collision Ticket Office at 703-590-2311.